First the good news. We finally decided a second dog wasn't the way to go for us. 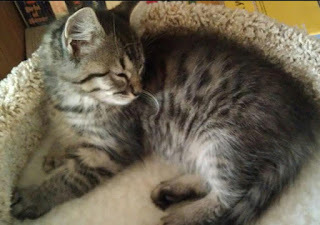 Last Sunday we adopted an 8 week old Humane Society kitten and named him Simon. He's already had his first shots and has been neutered. He and Hannah are working on becoming friends. We love him to pieces! Here he is just chillin'. 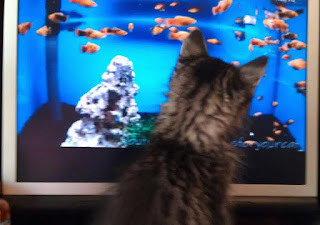 I put up a YouTube video of Fishies for him to watch. Now the bad news. After doing so well (for months and months and months) on my current psyche meds.. well.. I'll just say they need to be changed. My depression is getting really bad and my anxiety level is HIGH. (I have an appointment this month on the 27th.) I feel almost frozen in place and even the most mundane things are extremely hard for me right now. 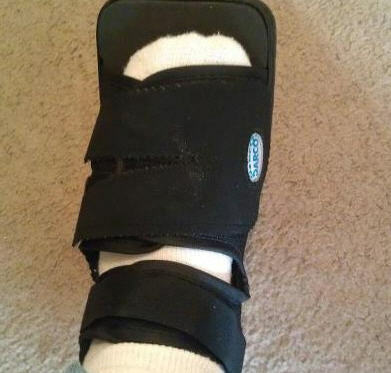 I also have a fractured foot. PLUS - About a month ago my primary physician took me off the med that helps with the stomach disease I have which was caused by diabetes. She said thought it was the culprit behind some other symptoms I'd been having. Ever since then I've had recurring stomach pain. There's a couple other things going on but think I'm already sounding like a bit of a hypochondriac. I'll stop here. Hope you get your meds sorted soon! I'm so sorry about your foot and your meds. I hope you're feeling better soon. LOVE your new kitty! I would just love on him so much. he's adorable! Such a cute kitty! I am glad he and Hannah get along. Yikes about your foot. Take it easy lady :) And vent about whatever you want. If someone thinks you are a hypochondriac they can just move on to a different blog! I pop by every now and then. Just thought I'd say HELLO!!!! I hope your foot is healed by now!! Hey Im sorry to bother you. My name is Devin Mundreon and i'm 22. I've been doing some personal research on 'Adults with PTSD from childhood' lately and came across the Poem "The Scream". I noticed that you were the person who posted it. If you don't mind I was just curious on how you came across that Poem? If you could point me in the direction of where it came from I would appreciate it more than you know! Thank you for taking the time to read this email. If your busy and don't have an answer then thats fine but it would be so great if you could let me know. I mean no pressure just want to make sure that my intentions are nothing but the best! Thats Insane you pulled the words and feeling right out of my throat. thanks for giving me the opportunity to be able to have someone to relate to! It was an accounting of how I felt after years of abuse. I share it for the reason you stated.. to let others they are not alone. I ask you not to duplicate or share it. Like I said at the end of it, "It is mine and mine alone."